Can verbena treat pain, infection, seizures, and cancer? Vervain (Verbena officinalis) is a flowering plant in the verbena family of herbs. 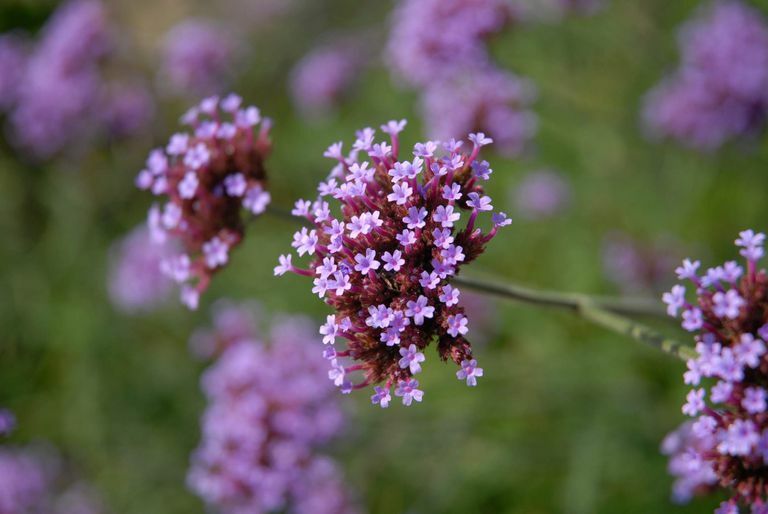 While there are well over 250 species of verbena, vervain refers specifically to the types used for medicinal purposes. In addition to V. officinalis, less common varietals include blue vervain (V. hastata) and white vervain (V. urticifolia). Verbena officinalis is a perennial plant with delicate, jagged leaves and small, five-petaled blossoms. Although vervain has no scent, alternative practitioners believe that vervain has anti-inflammatory, antibacterial, antispasmodic, and analgesic (pain-relieving) properties beneficial to one's health. Vervain is also referred to as American blue verbena, simpler's joy, holy herb, mosquito plant, and wild hyssop. In traditional Chinese medicine, it is known as mǎ biān cǎo. Verbena officinalis should not be confused with lemon verbena, a garden herb used for cooking that also has medicinal properties. The medicinal use of vervain can be traced back to the 18th century book "Sauer's Herbal Cure," where it was said to aid in the treatment of kidney stones. In fact, the name "verbena" is believed derived from the Celtic word ferfaen meaning "to drive away stones." Vervain regained popularly in the 1930s as one of the 38 flowering plants used in a homeopathic tincture called Bach Flower Remedy, variations of which are still sold today. Among its purported benefits, vervain may help treat. As with many homeopathic remedies, some of the health claims are better supported by research than others. A number of studies have looked into the anti-inflammatory and analgesic effects of Verbena officinalis, both in topical and oral formulations. Results have been largely mixed. A 2006 study from Spain found that an extract of V. officinalis, applied topically in rats, was as effective in relieving edema (swelling) as traditional anti-inflammatory drugs, but it was far less able to relieve pain. Verbena tea has long been believed to have a calming effect that can help relieve stress and promote sleep. This effect was first described in the 1652 book "The English Physician" in which vervain was used as a tea to treat "over-enthusiasm." Although there have been few studies investigating these effects in humans, there is evidence that V. officinalis not only reduces anxiety and insomnia but may prevent the occurrence of epileptic seizures. These effects are attributed to a sugar molecule in vervain, known as verbenalin, which is believed to have psychoactive properties. ﻿A 2016 study published in the Frontiers of Pharmacology reported that an extract of V. officinalis, prescribed at a dose of 100 to 500 milligrams per kilogram, reduced the frequency and duration of tonic-clonic seizures in mice. Moreover, mice injected with the extract spent more time sleeping than those injected with a placebo. Anxiety, measured by movement through a maze, was also seen to improve. While it is unclear if the same effect would be rendered in humans, it does suggest that V. officinalis may exert a positive influence on the central nervous system and adrenal glands (which produce stress hormones). The treatment of infectious diseases, both common and severe, has become increasingly challenging in the face of growing antibiotic resistance. Vervain, long used to treat upper respiratory and urinary tract infections, is believed to exert antimicrobial effects that may help overcome these challenges. This is evidenced in part by a 2016 study in which different parts of the V. officinalis were able to eradicate 24 strains of disease-causing bacteria. According to the research, extracts derived from the stem of V. officinalis were able to kill Staphylococcus aureus and Pseudomonas aeruginosa in the test tube more effectively that the antibiotic amoxicillin. Similarly, the leaves of the plant showed considerable activity against Citrobacter freundii, while the root turned out to be highly effective against Bacillus subtilis. While is unclear whether the same results would be seen outside of the test tube, the research does provide evidence of vervain's long-presumed effectiveness in treating minor cuts and skin infections. Of all the conditions vervain is long presumed to treat, the prevention of kidney stones is one of the least supported by research. This is mostly because it is difficult to measure how effective a treatment is in not causing a medical condition. To date, there is little evidence to suggest it has any effect. One study from China found that mice treated with verbenalin injections experienced no changes in either the structure or function of their kidneys compared to mice provided a placebo. What vervain does appear to do is increase urine output, which may, in fact, help prevent the formation of kidney stones. But it does so not by increasing the amount of water and sodium in the urinary tract—the way that most diuretics work—but rather by irritating the kidneys. This can actually hurt the kidneys more than help, especially over the long term. One of the bolder claims made by herbalists is that vervain may aid in the treatment of colorectal cancer. These claims were largely fostered by research which showed that polysaccharides (a type of long-chain carbohydrate) in vervain altered the activity of colorectal cancer cells in test tubes. A 2017 study from China reported that an extract of V. officinalis polysaccharides interrupted the spread of colorectal cells by preventing their adhesion to healthy cells. Without the means to bind to healthy cells, a tumor cannot metastasize and invade distant organs. This suggests that vervain polysaccharides may one day be used to help isolate and control tumors in people with colorectal cancer, improving survival. However, more research to this effect is certainly needed. As an herb, V. officinalis is considered safe for consumption with few side effects, namely indigestion and gas. The herb also produces an oily substance that may cause contact dermatitis, but a generally mild form with localized rash and redness. Before using a vervain tincture, always apply a little to the skin and wait an hour to see if a rash develops. Severe anaphylactic reactions are rare. It is not known if vervain interacts with other drugs. Advise your doctor about any supplements you are taking to avoid possible interactions. Vervain should be avoided in people with kidney disease. The verbenalin found in the plant can irritate the kidneys if overused, causing inflammation and a potential worsening of the condition. Little is known about the long-term safety of vervain supplements. For this reason, they should not be used in children, pregnant women, or nursing mothers, or for the treatment of any serious medical condition. Self-treating any medical condition without input from a qualified doctor or avoiding the standard care of treatment is unadvised and may put you in harm's ways. There are no guidelines for the appropriate use of vervain in treating medical conditions. Supplements are typically sold in capsule form but are also available as tinctures, extracts, astringents, teas, powders, and dried herbs. Capsules are available in doses ranging from 150 milligrams to 1,000 milligrams. When taken within this range, they are generally considered safe. Vervain supplements are intended for short-term use only. Dietary supplements in the United States are not regulated in the same way as pharmaceutical drugs. They are not required to undergo rigorous testing or research and, as such, can vary in quality. This is especially true with regards to the use of traditional Chinese herbs and other folk remedies. According to the National Center for Complementary and Integrative Health, some Chinese herbal products are safe, but others are not. There have been reports of some products being contaminated with drugs, pesticides, or heavy metals or not containing the listed ingredients. To ensure quality and safety, only buy supplements from trusted manufacturers, ideally, those who voluntarily submit their products for testing by an independent certifying body like the United States Pharmacopeia (USP) or ConsumerLab. Do not be swayed by claims that a supplement can treat or cure specific health. Under the law, it is illegal for supplements manufacturers to make such claims. Can you grow your own vervain? Vervain can certainly be grown in home gardens, but be sure to buy V. officinalis seeds rather than ornamental varietals, like V. bonariensis. The plant grows well in full to partial sunlight and well-drained soil. V. officinalis will grow between 12 and 36 inches in height and develop clusters of tiny white or purple flowers. The growing season is from mid-summer to early fall. If used for tea, avoid spraying the herbs with pesticide or using chemical fertilizers. Once harvested, you can use the herb fresh or dry it in a dehydrator for future use. Can Green Tea Treat Breast Cancer? Ahmed, D.; Qasim, K.; Ashraf, C. et al. Verbena officinalis a herb with promising broad-spectrum antimicrobial potential. Cogent Chem. 2017;3:1. DOI: 10.1080/23312009.2017.1363342. Jin, C.; Liu, X.; Ma, D. et al. Optimization of polysaccharides extracted from Verbena officinalis L and their inhibitory effects on invasion and metastasis of colorectal cancer cells. Trop J Pharm Res. 2017;16 (10):2387-94. DOI: 10.4314/tjpr.v16i10.11. Khan, A.W. ; Khan, A.; and Ahmed, T. Anticonvulsant, Anxiolytic, and Sedative Activities of Verbena officinalis. Front Pharmacol. 2016;7:499. DOI: 10.3389/fphar.2016.00499. Miao, M.; Guo, L.; Yan, X. et al. Effects of verbenalin on prostatitis mouse model. Saudi J Biol Sci. 2016 Jan;23(1):S148-S157. DOI: 10.1016/j.sjbs.2015.10.006.